Santiago's Finest Hour is the name of the first collection of artwork ever created by the artist and marine biologist Guy Harvey. This series was first displayed in 1985 and is inspired by Ernest Hemingway's classic, The Old Man and the Sea. The dramatic events told in the story by Hemingway are a common theme throughout the series. These original ink drawings have been officially licensed to appear on silver bullion through an exclusive partnership with Gainesville Coins. Based on Ernest Hemingway’s classic, The Old Man and the Sea, Guy’s original take on the story’s protagonist becomes manifest in “Santiago’s Finest Hour.” The culmination of many sketches from Guy’s adolescence, this arresting, lifelike work of art depicts Santiago (the old man from the story) hooking an enormous marlin as it jumps majestically out of the water. Done entirely in pen and ink, the piece captures one of the high points of action in the story, the moment when the fictitious 18-foot fish is struggling against the old fisherman before finally being caught. This image was the first among a series of 44 ink drawings (all inspired by Hemingway’s Old Man and the Sea) that were displayed at Guy’s first art exhibit in Kingston, Jamaica in 1985. One of the advantages that coins have over bullion bars is they are usually more visually appealing. There's no reason that silver bars have to be boring! 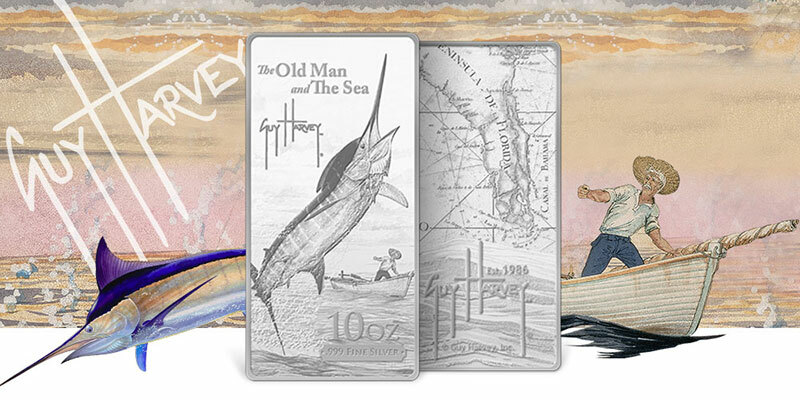 The unmistakable artwork of Guy Harvey has been officially licensed to appear exclusively on Gainesville Coins' The Old Man and the Sea 10 oz Silver Bar, which reproduces the cover artwork from Harvey's first-ever professional work, a collection known as Santiago's Finest Hour. Never before has Dr. Harvey's work been used for silver bullion. 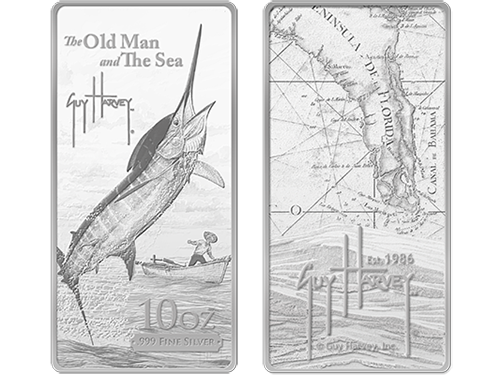 Even better, a portion of the proceeds of each The Old Man and the Sea 10 oz Silver Bar benefits the Guy Harvey Ocean Foundation. The dramatic scene that appears in (and graces the cover of) Guy Harvey's Santiago's Finest Hour appears on the front side of the bar. The "old man," Santiago, is shown in the distance in his humble boat as he struggles with a huge blue marlin on the other end of his hook. The fish dominates the foreground, jumping from the water as it attempts to escape the fishing line. The waves crash beneath the marlin while the sky is filled with ominous clouds in the background. The top-left portion of the design bears the inscription "The Old Man and the Sea" with the easily recognizable Guy Harvey signature below. The bottom of the bar features the weight, "10 oz," and the purity, ".999 FINE SILVER." Meanwhile, the back of the bar depicts an antique Spanish map of the Peninsula of Florida. The Guy Harvey signature appears again at the bottom of the design, with "Est. 1986" just below.